The weather here in Connecticut has been cool and beautiful. Perfect dyeing weather for boiling dye pots. 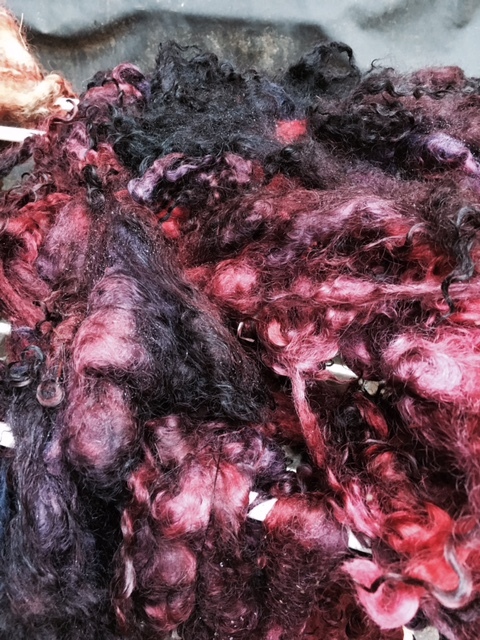 With the 9 pounds of Lincoln wool I cleaned it was time to begin dyeing and getting ready for the fall shows. I have pretty much switched over to Pro Chem dyes. Their colors are warm and dye perfect. The color holds so nice and their selections of colors are limitless. I was going good for the colors of the sea and I was quite pleased. Once the fleeces are dried I will post the finished results. While still drying, this fleece has different variants of purples and lavenders. While boiling it tends to look like a hot mess, but the end results are amazing. This fleece while still drying reminded me of a Victorian woman's dress. Using black and burgundy shades, I look at it and am taken back to a simpler time. So fleeces are still drying, the variant of color came out quite nice. Once dry I will post the results of the fleeces. It's all in the product!